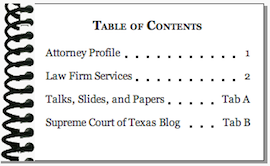 During my time running SCOTXblog, I built some tools to track cases under review by the Supreme Court of Texas. Through the years, I have added other features, such as a richer version of the weekly order lists, a running total of each justice's opinion output, a breakdown of where each petition stands in the review process, and an interactive chart that lets you explore how often each pair of justices votes together. I've used some of this data in my own CLE presentations, including talks about amicus practice at the Texas Supreme Court, how the voting patterns on the Texas Supreme Court have changed over the years, and exploring what the data can tell us about reversals and affirmances in Texas's intermediate courts of appeals. The Cert Pool website tracks and analyzes the U.S. Supreme Court's docket. In particular, you can find the status of petitions from your state or federal circuit, amicus filings in current cert petitions, requests for the views of the solicitor general, or the conference list for the Supreme Court's next internal conference.